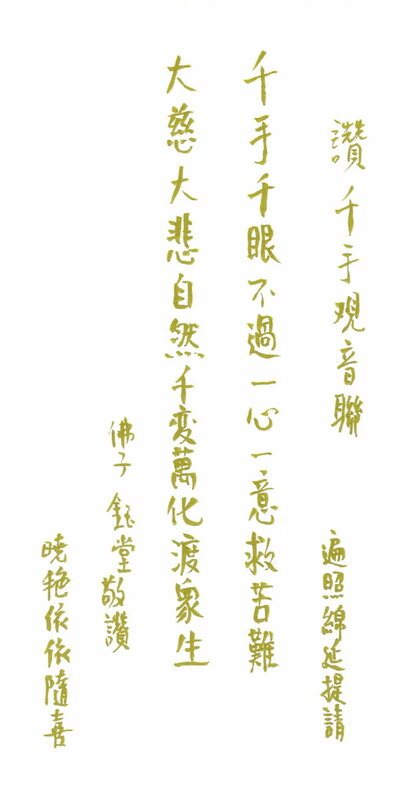 In F1506 the last two sentences of F1505 are expanded to form a Chinese couplet. The beauty of the couplet will be difficult to present in English, so I will not attempt the translation. May all beings attain Enlightenment soon! 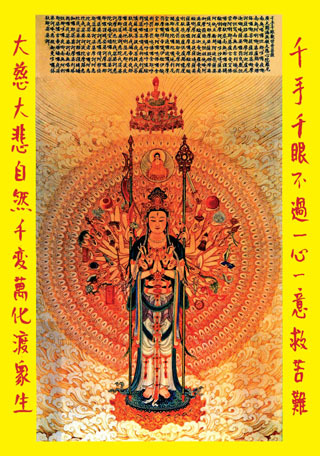 Earlier today I composed the couplet in praise of Thousand-arm and Thousand-eye Guan Yin. This evening I wrote it in calligraphy. Afterwards I passed by my entrance door and noticed a package left on the porch. And it is the package sent by Yong Lee. So right after I composed and done calligraphy to praise Guan Yin, the ring you offered is now on my right middle finger. It is so auspicious, as if Guan Yin is rewarding me for writing the praise. So I share this auspicious event with all on my list. It is a gold ring with one dragon each inscribed on two sides of an oval shape Lapis Lazuli. I forgot to mention that the design of the two dragons, one facing each way, is wondrous. They are circling the Lapis Lazuli stone in clockwise direction. Thus it is in accordance with the Dharma and seems to form a protection circle around the mandala of Medicine Guru Buddha in the center. This amendment is also Bcc to all on my list. Disciple Jing Xing had prepared Thousand-arm Thousand-eye Guan Yin card for printing. He will distribute them to all for free.